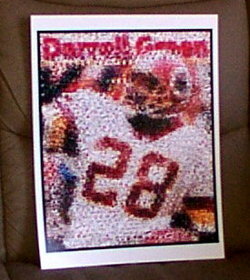 This is an AMAZING Darrell Green Montage. At first glance this looks like a picture of the best Skins CB ever but look closer. Its actually 100's of mini-pictures that are 1/4 inch by 1/4 inch with remarkable detail(click on "close up" image). The mini-pictures are of everything Redskins including logos, vintage pictures and action shots. The entire item is 8 1/2 inches by 11 inches and perfect for framing. We guarantee this to be high quality and authentic. The uniqueness of this item cannot be understood truly until you see it in person. As seen Nationaly on Coast To Coast AM!